Home > News > How Can You Make Your Business Smarter? With new technology being developed to increase our productivity, help us with daily tasks and improve our comfort and security, people are starting to realise the benefits of smart technology within their homes and businesses. 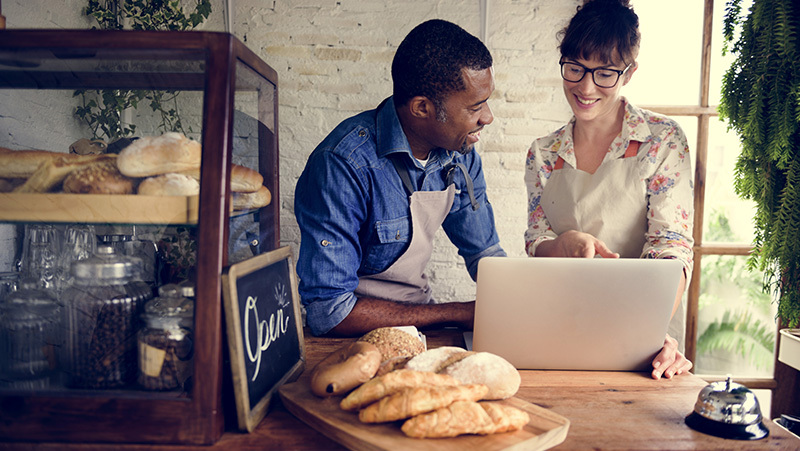 Smart technology can help to create a smarter business with new entrepreneurs and small businesses using new devices and new ways of working to help streamline their business. Smart technology are devices or software which can easily communicate with people or other ‘smart’ objects around them. It uses the internet to offer more interaction and control of the devices around us. You may have heard the term Internet of Things that refers to the billions of physical devices around the world that are now connected to the internet, collecting and sharing data. HOW CAN THEY BENEFIT YOUR BUSINESS? By using smart devices to automate processes which would normally take a long time, it can save businesses hours of manual work. You can use them to organise calendars, email mailboxes or automate ordering, allowing you to focus on more important jobs within the business. Smart security devices are now available so you can keep an eye on your business without being there. You can use smart cameras, locks and alarm systems alongside a smartphone app to view footage in real-time, allow someone access to the building and trigger an alarm if required. Paperless offices save energy and reduce the need for wasteful products. Investing in smart lighting, plugs and thermostats will mean you’re only using energy when you need to. Switch thermostats on via an app on the way to the office, or switch lights off when rooms aren’t in use. These can all help save energy throughout your business. By reducing your energy consumption, you could also save your business money on its energy bills. Using smart meters, you can keep an eye on exactly how much energy you’re using in pounds and pence, so you won’t be stung with large estimated bills. By better understanding your energy consumption you can take steps to reduce the amount that your business uses. With the rapid development of smart technology, there are now more smart devices available than ever before. These devices can be great in small businesses and could help you increase productivity while decreasing your energy costs. Alexa is Amazon’s voice-controlled, virtual personal assistant. It’s used via an Amazon Echo device to make calls, set alarms and timers, check your calendar, manage your to-dos and listen to and make business calls. It works alongside other compatible smart devices for easy communication throughout the workplace. Having the ability to turn on/off remotely via an app, means you don’t need to worry about leaving lights turned on at the end of the day. Swap your normal lightbulbs to smart LED lightbulbs and you could also help to cut your energy consumption – businesses could save up to 80% by switching from 60W regular bulbs without the loss of brightness or quality. Using smart plugs, you can make your ordinary appliances ‘smart’ by plugging them into sockets. Using with an app or Amazon Echo, you can switch your devices off/on and define routines to help your business run more smoothly. CCTV is often used throughout business premises, but now instead of checking back through hours of footage, you can view CCTV from a smart camera in real-time on an app. CCTV cloud cameras allow you to access footage at any time and alert you of any suspicious activity on the premises. Many smart doorbells also feature cameras so you can keep an eye on who is coming and going, all through the app. Smart meters allow you to get on with the day-to-day running of your business while your energy supplier automatically receives your meter readings and sends you accurate bills each month, so you only pay for the energy you use. Smart meters are helping businesses become more energy efficient. By installing one in your business, you’ll gain a better understanding of how you use your energy. They also allow you to keep track your energy usage patterns and allow access to more detailed reports, giving you an idea of how you’re using your energy and how you can reduce your consumption. For more information on getting a smart meter installed in your business, speak to us today on 0115 975 8258 or visit our Smart Meters page. If you sign up to our Smart Fix energy plan you’ll receive our Smart Package which includes a FREE smart energy display and £15 annual credit per meter. Read more about our Smart Fix offer.